Work and thought book for learning the Hebrew Aleph-Bet. Great preparation for children approaching first grade. Connect-the-dots workbook using Hebrew letters to create images for coloring. Requires knowledge of Hebrew Aleph-Bet. 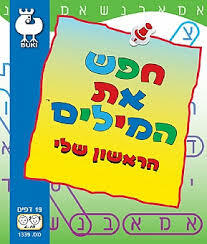 Entertaining sticker book for learning to recognize, write, and sound out Hebrew letters. Includes an assortment of letter games. A comprehensive workbook, filled with a collection of activities to prepare your child for the first grade. Activities include Hebrew lettering, basic arithmetic, and other activities aimed at developing verbal, mathematical, and thinking skills. A series of workbooks that teach Hebrew lettering. The series presents letters and numbers along with colorful illustrations, which make writing an entertaining experience. Includes stickers.